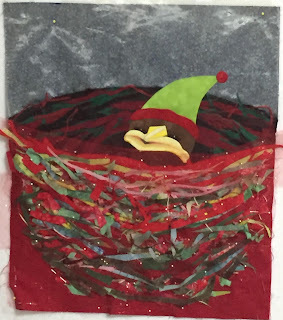 Now that most of my quilting friends know that I am making a series of fiber art nest quilts, they bring me all kinds of things that they would normally throw away. 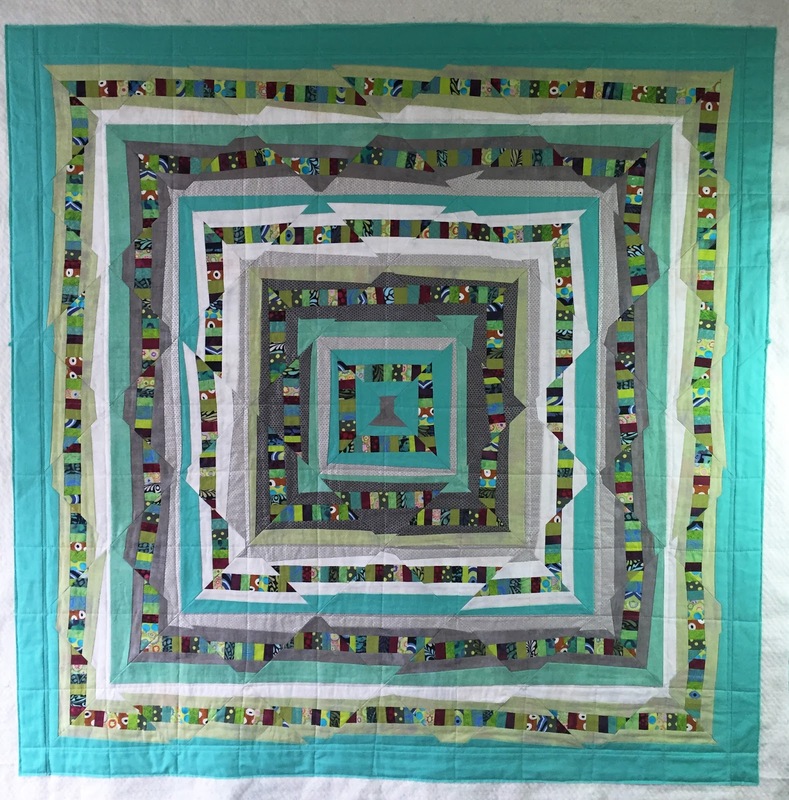 This quilt started with some scraps that were green and red that one of those friends had given me. 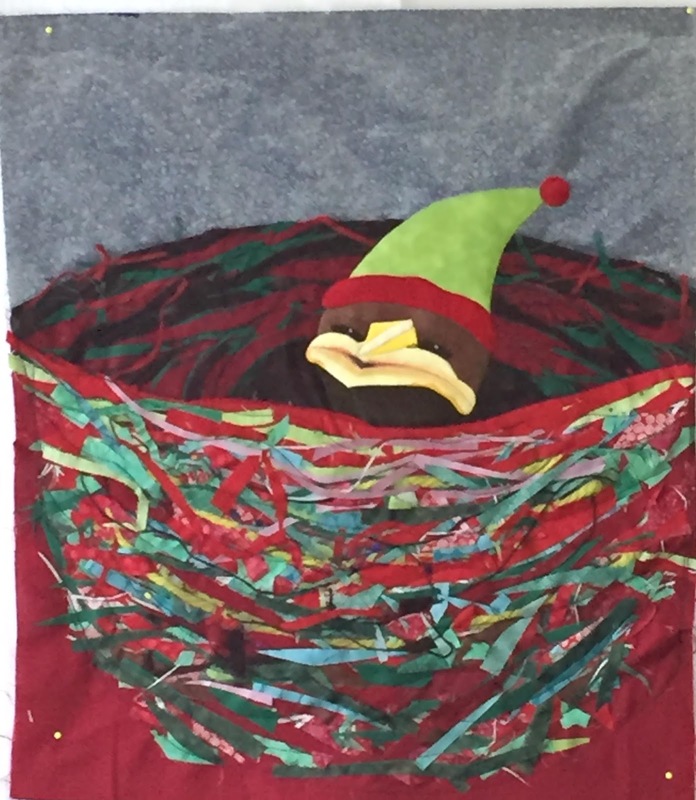 I made the sketch quite a while ago, and decided to get the quilt going right before Christmas. 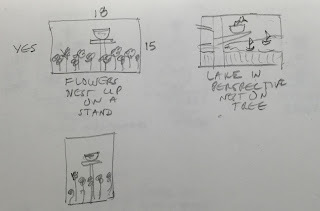 What I'd like to show you in this blog is how I audition materials on my design wall and how I stabilize the top so it can support the weight of the nest. I'm showing you the nest materials that I picked to go with the scraps I received, the blue material I picked for the upper background, and how the background looks after adding some organza on the top to tone down the brightness of the blue fabric. Our brains are wired for curiosity. 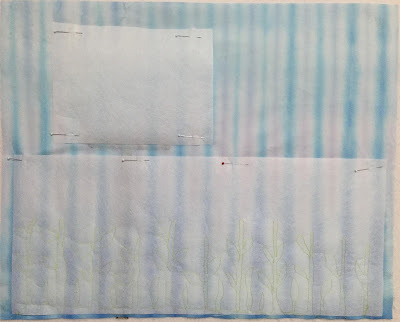 So I like to leave some details in my art quilts that you can only see if you get up close, like the sky in this quilt. 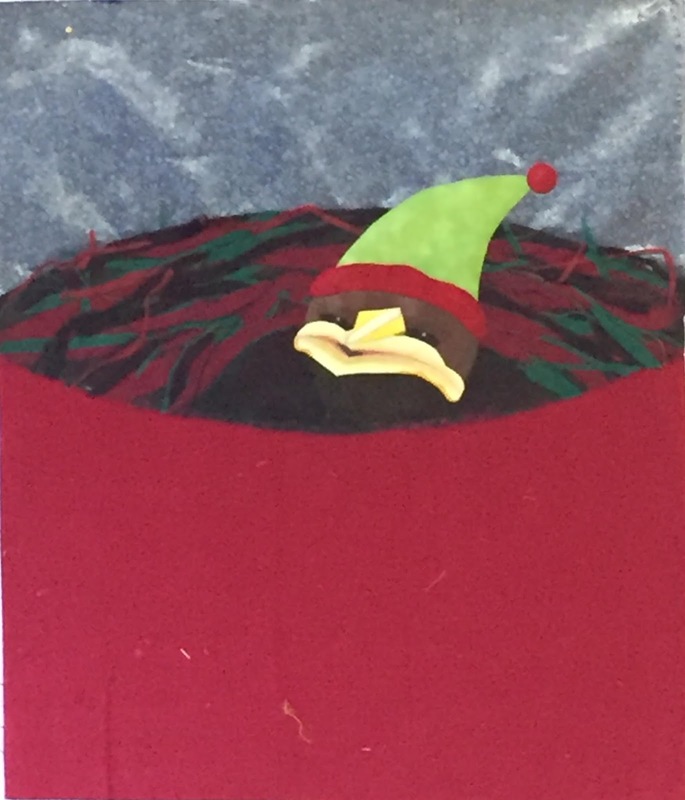 The bird was made as a separate piece, then sewn to the background before the nest was built. My granddaughters told me this had to match the bird I made for a previous nest quilt. So I dug through my materials and found the pattern. I painted the face with both colored pencils and inktense pencils, finishing it off with fabric medium. Here is where I want to show you all the stuff I put on the back to support the artwork on the top. I laid down 2 layers of batting to stuff the bird and it's hat. And to support the nest, I added a mid-weight tear away stabilizer, which I trimmed after sewing. Seeing the innards is like looking at how a fancy bridal dress is made. 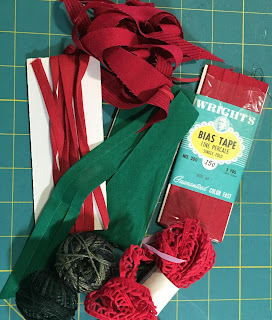 I should have taken a picture of the pile of scraps that I received, but you can see in the photos below that they were bright and tiny. I wanted to cover them up with a bit of shiny red tulle, but decided against that and instead went with a gray tulle. 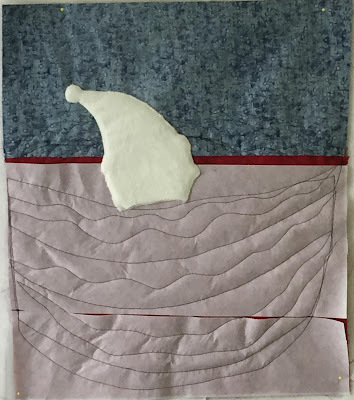 After quilting, the top was finished off with a facing. I hope you like it! I'm so excited to have been accepted into an art gallery for a show in September 2016. When I started my journey with the nest art quilt series, I had the intention to make 15-20 nest art quilts and get them into a show as either a special exhibit at a quilt show, or as a solo show in an art gallery. In late November, I got a call from Second Story Gallery in Camas, Washington. They let me know they have scheduled my show in conjunction with an acrylic artist who is an avid birder. This will be a perfect combination, and we both will be showing about 15 of our works. I'm so pumped now to look at my collection of art quilt in the series and fill in some gaps with new quilts. The next one in the series is called, "Summer Breeze". 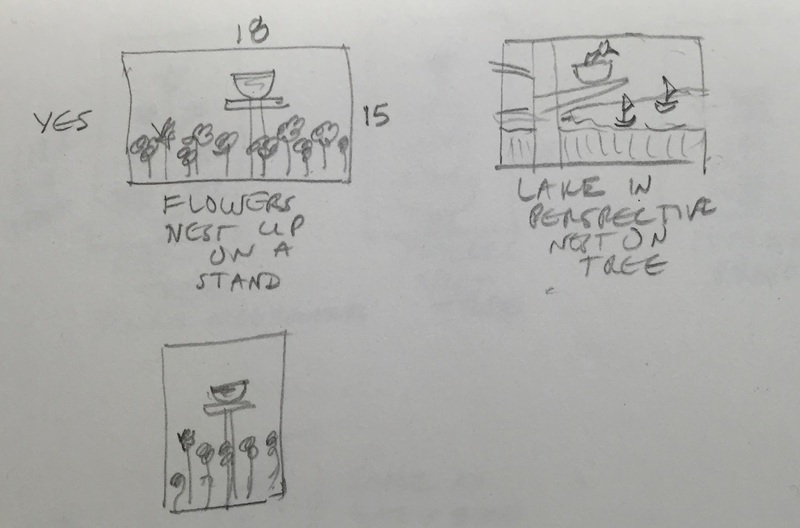 Here's my sketch ideas. I picked the 15" x 18" one that says, "YES". This little quilt reminds me of summer flowers and birds coming back into the yard. That's a good thing since we had a record amount of rainfall this month. I added a cut away stiffener to the back of the quilt to support all the stitching and weight I plan to add to the front. 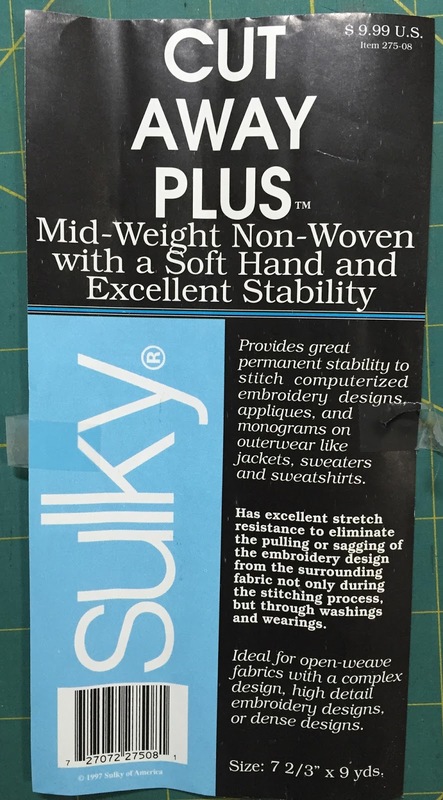 It is a product from Sulky, called Cut Away Plus. I only put it where it's needed, and after stitching, it gets trimmed. 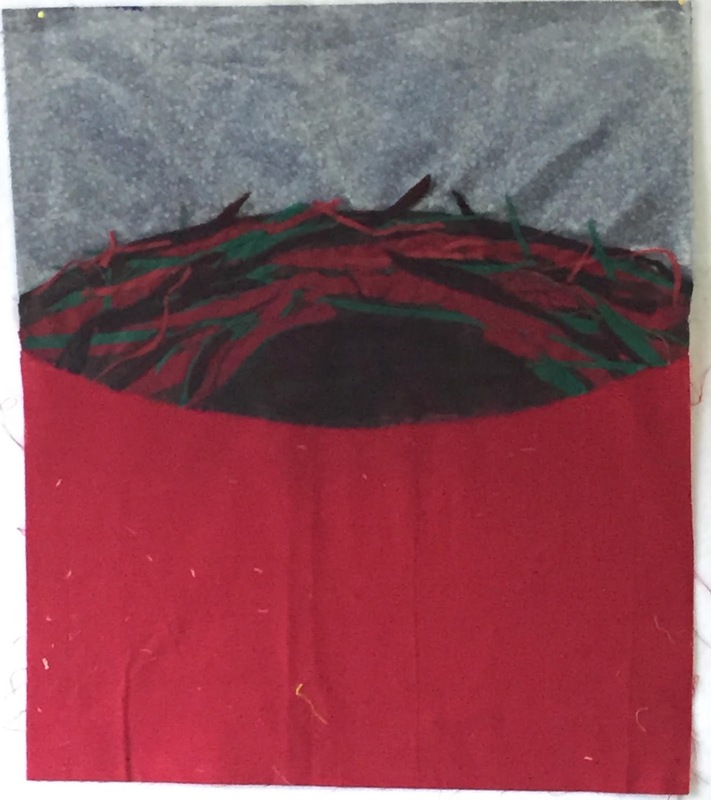 After I stitched down the pole, I free form stitched some stems and leaves. These will be the first layer in the background. I colored these in with Derwent Inktense pencils. 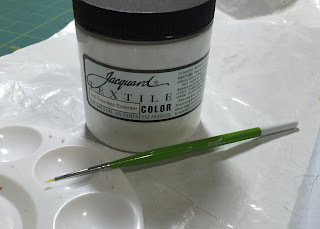 Then using a small fabric paint brush, I brushed on some Textile Medium. 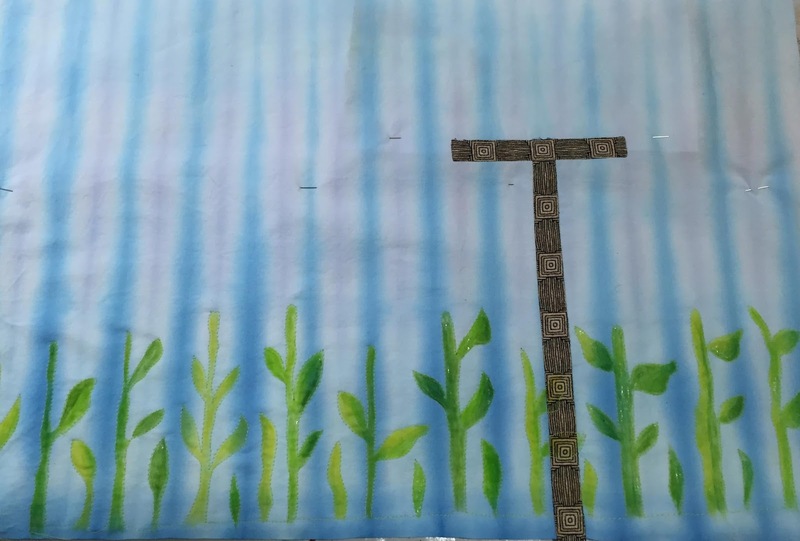 Once the green parts were dry, I stitched on the flowers, painted them in with both colored pencil and Inktense pencils, and repeated the fabric medium to set the colors, and let this dry overnight. For the flowers, I remembered a technique recommended by one of my art quilt friends. 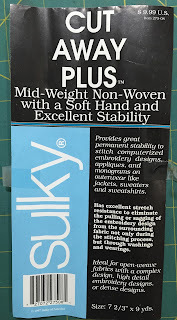 I used two layers of fabric, back to back, and sandwiched the fabric between layers of Solvy Wash Away Stabilizer. I traced the flowers from my drawings right onto the Solvy, then sewed on the lines with a straight stitch. Then I zig-zag stitched a couple of times. 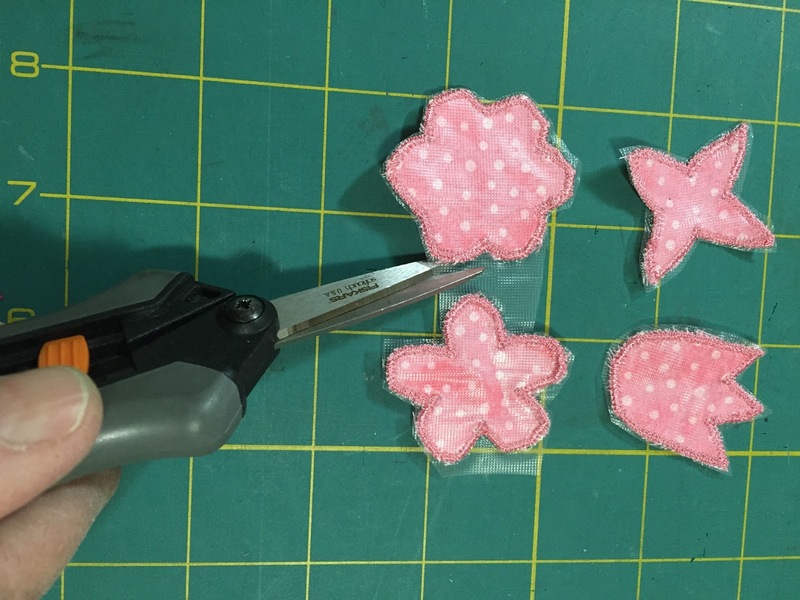 The Solvy dissolves easily in water, and if you want a little stiffener in the fabric, you can take the pieces out and blot them lightly, letting them dry and stiffen overnight. Otherwise, you would rinse thoroughly. How do you like the concept so far? 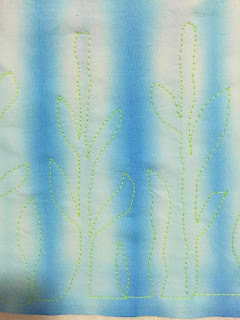 I'll continue the blog next week with the second half of this little quilt, called "Summer Breeze". I'm a fan of washing quilts after you finish them. I'm also a fan of washing quilts when they get rotated off the bed. And yes, I'm a stubborn fan of pre-washing all of my fabric! 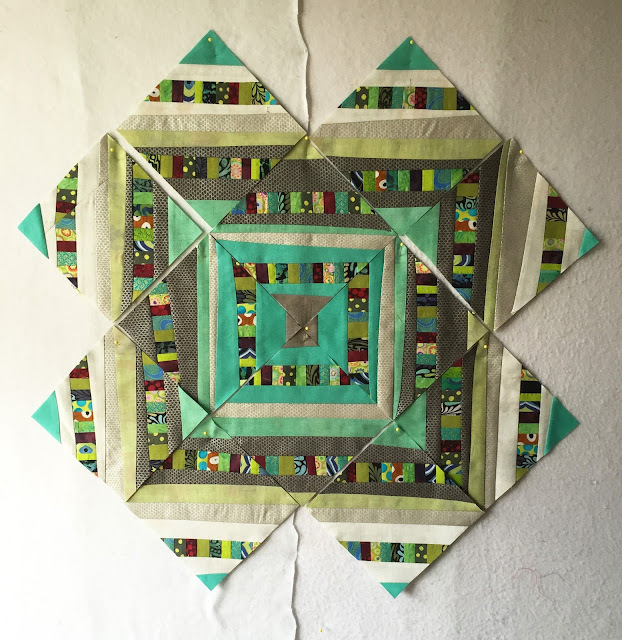 I know that I am giving up that nice crisp look of a starched and completed quilt. But I also know that I have had the poor thing on the floor, around my quilt studio, in my lap, maybe the cat's lap (or visa versa), and have probably nibbled on something while the quilt was nearby. For sure, I have had my hands all over it by the time I'm done. 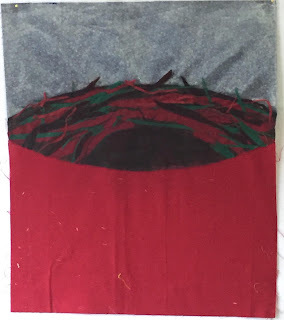 Sometimes, I have used glue somewhere in the quilt, and almost always, I have basted the quilt with dissolving thread. I like to know that all of this kind of stuff is gone before I call the quilt complete! Quilt Soap. I always use Orvus Paste to wash my fabric and my quilts. It is actually a horse shampoo that I buy in the farm and garden stores in a big jug. But you can find this in quilt stores in small amounts and it's called Quilt Soap. What is so great is that it is a near-neutral pH, synthetic soap that dissolves and suds easily in cold water. It won't strip the color from the fabric and rinses out easily. Soak in the tub. The first thing that I do is to gently swish and soak the quilt in the bathtub. 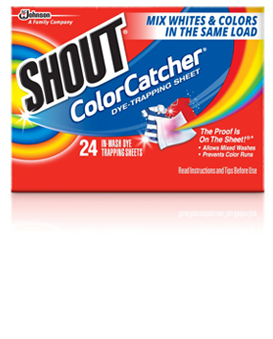 I fill the tub with slightly warm water (closer to cold, really), and add a Shout Color Catcher. Then I lay the quilt into the water and gently swish it around. If the water starts to turn color, I empty the tub and refill it with clean water. I sometimes repeat this step several times until I get clear or slightly cloudy water. Then I let the quilt soak for 10-15 minutes. I gently squeeze out the excess water and put the quilt into a large laundry basket and carry it to the washing machine. Wash in the machine. The second step is to gently wash the quilt in the washing machine. 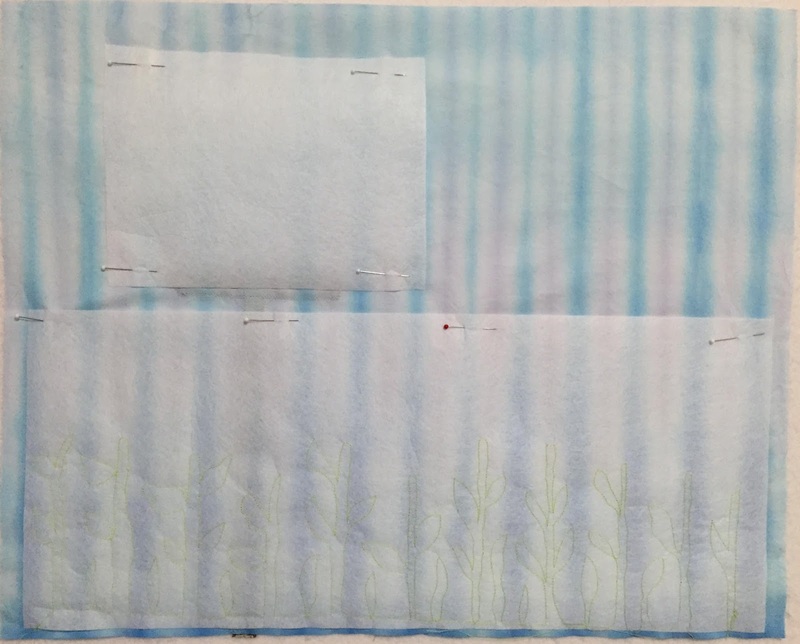 I have a front loader and I put a small amount of Orvus Paste in the machine, set the machine to the delicate cycle and run it on cold water. 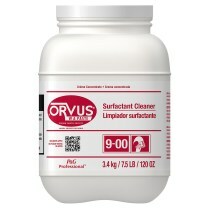 When I used to have a top loading machine, I would fill it with water and add the Orvus Paste. After it got sudsy, I turned off the machine and then placed the quilt into the machine. I used my hands to gently swish the quilt up and down and then let it soak for 10-15 minutes. 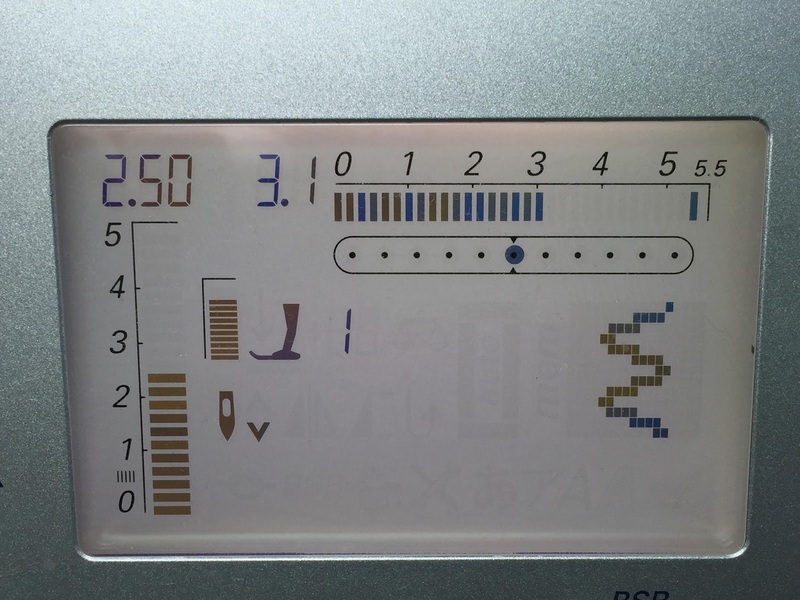 I would then run a couple of rinse cycles (turning the machine off to avoid agitation) and a couple of spin cycles. Dry in the machine. My next step is to put the quilt in the dryer on low heat until the quilt is slightly damp. This doesn't take very long if you've done a good job on the spin cycles in the washing machine. Dry on the floor. The final step is to remove the slightly damp quilt from the dryer and lay it on the floor to complete drying. I cover the carpeted floor with a flat bed sheet first, then smooth the quilt out on top of the sheet. Sometimes, I'll pin the corners and get serious about straightening the edges. Often, however, smoothing it out is good enough for me. Once in a while, I'll add fans in the room to speed the drying process. When I'm done, I have a nice soft quilt ready to sleep under or display. 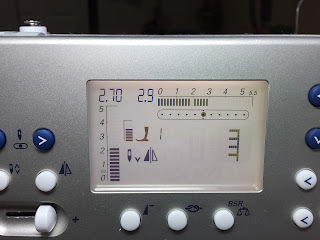 I hope this helps you if you also want to (or need to) wash your quilts! 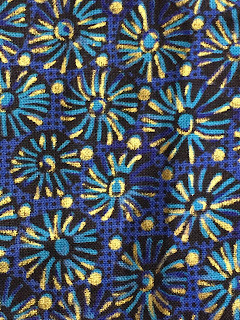 I have to share a favorite stitch that I use for quilting. It's a serpentine stitch that can be changed from the factory setting to look like a meandering, playful, free form stitch. What I really like about it, besides the look, is that you can stitch it with the walking foot, so that you end up with neat and even stitches. 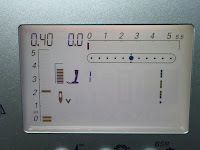 Here is a picture showing the stitch. This is stitch #4 on the Bernina 440 machine. I changed the width to 3.1 mm and the length to 2.5 mm. I also set my straight stitch to 0.4 mm long and used this stitch to stop and start .... and also to go around the corners. Here is what the screen looks like for both settings. For this quilt, I used the stitch 9 times side by side in one area of the quilt. At each corner, I used the tiny straight stitch. 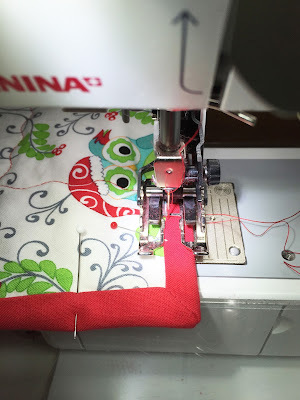 I stopped just short of the corner, switched stitches, turned the quilt, and took a few more stitches, then switched back to the serpentine stitch. 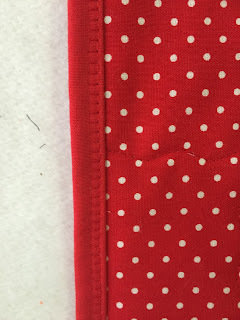 I like the look that I get at the corners when I use the straight stitch and I feel like this secures the stitches. 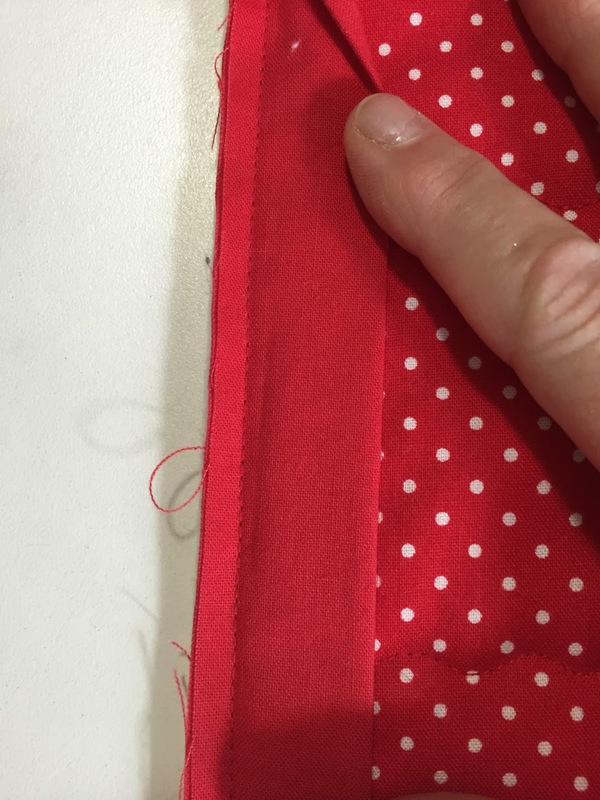 Here is a picture showing how close to the corner I sew before changing the stitch. I hope you like this stitch and will try it out on your quilt! 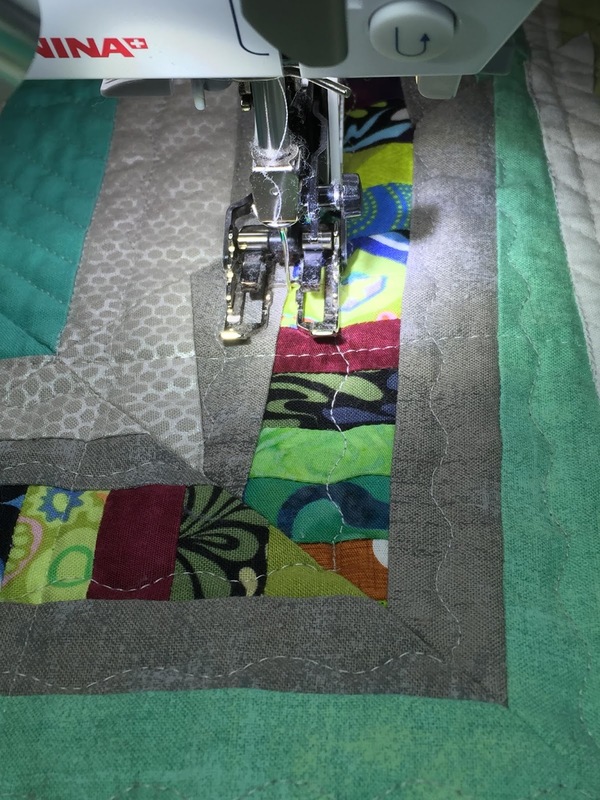 I was talking with a friend who has been a seamstress/sewer her entire life, but is new to quilting. 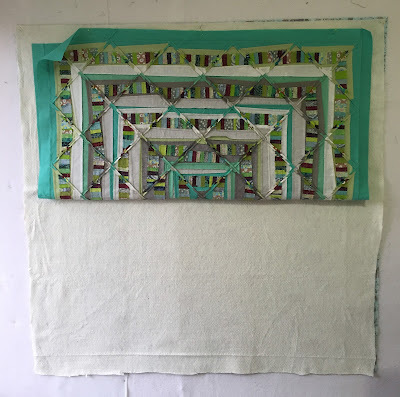 She asked about using old cotton thread that was inherited from an estate, and this evolved into a much longer conversation about all types of thread and what you should use in a quilt. Threads have come a long ways baby since our childhood. USE QUALITY THREAD. 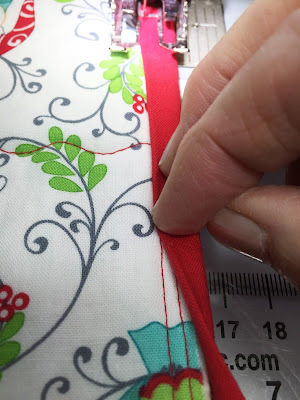 If you're a quilter and you spend one or more years making your "labor of love" quilt, you really do need to buy quality thread and quality fabric. Purists demand long fiber cotton threads and I have used them for many years. My favorite manufacturers are Gutermann , Mettler, and Aurifil. All of these are 50# thread and are readily available where quality quilting fabric is sold. 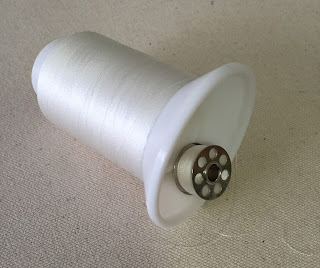 I have stocked up in many colors, preferring to buy spools of thread when there is a sale. If you sew a lot of quilts, like me, it's more cost effective to buy the larger spools and stock up in neutral colors. 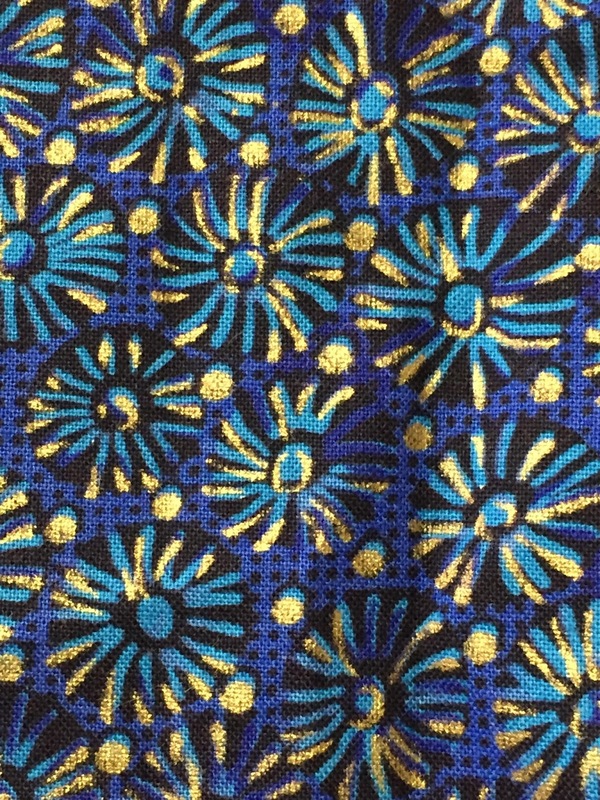 A new trend in threads is a set of threads that coordinate with a well known celebrity quilter or fabric designer. MATCH THE THREAD TO THE QUILT. The type of thread you use depends on the purpose and use of the quilt. If your quilt is going to be an heirloom bed quilt, for sure you should use cotton thread. Many quilts are made for children and will be washed a lot and may be threadbare after 10 years. 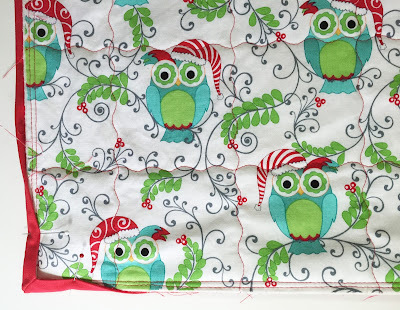 It's OK to use polyester thread, or even your old thread for these quilts. I would still opt for quality thread, though. That's because the inexpensive brands are often thicker and create a ton of lint in your machine. Are you an art quilter? Well, then the sky is the limit. You can use heavy, thick, thin, silk, cotton, polyester, rayon, or anything else you can get through the needle or bobbin of your machine. 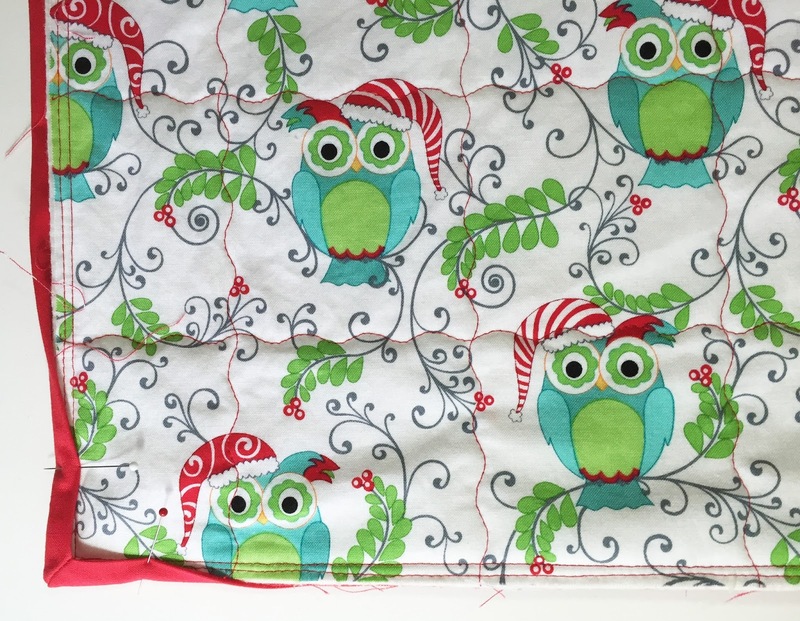 You can use anything because your quilts won't ever be washed. SUPER FINE THREADS. 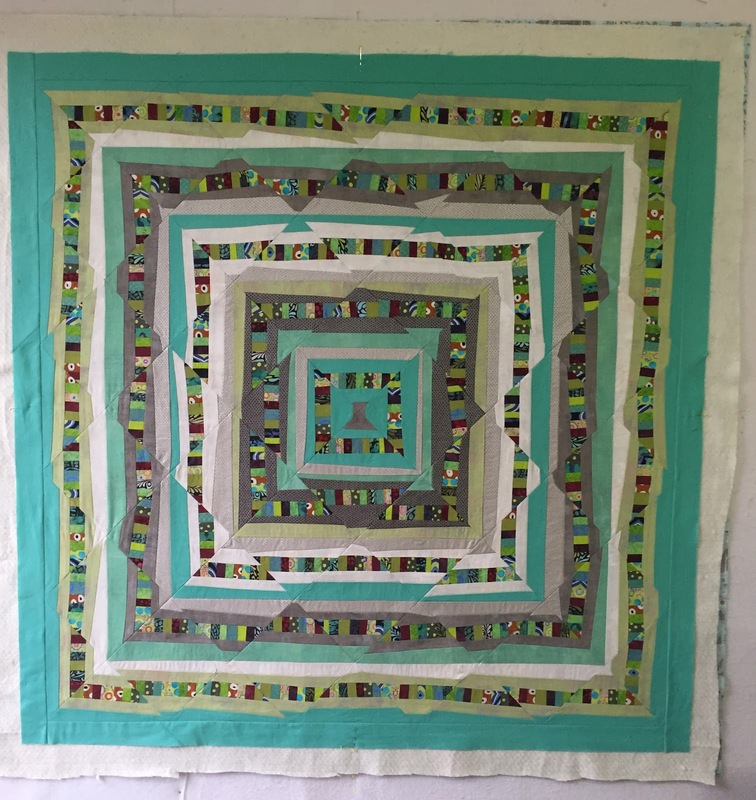 Quilters who make hand applique quilts like to have fine threads that match their fabrics. They often use a 100# silk thread and have a collection of colors in their sewing kit. 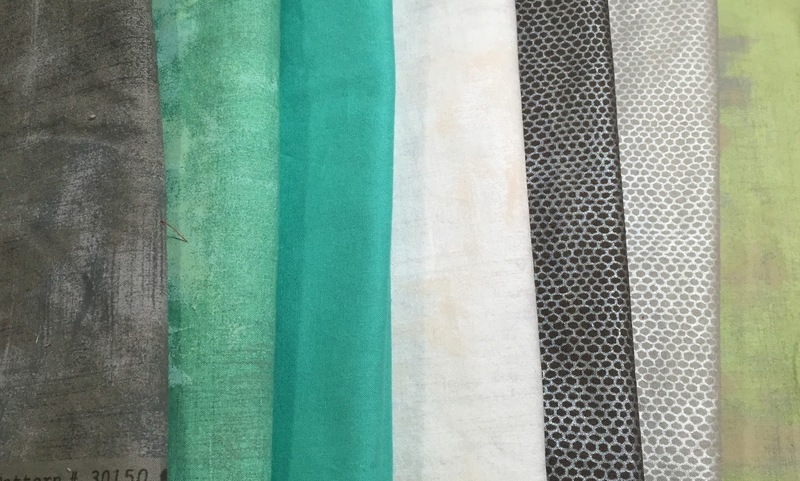 I have threads from YLI, Tire (which is now sold by Superior in 50#), and Kimono Silk Thread from Superior. 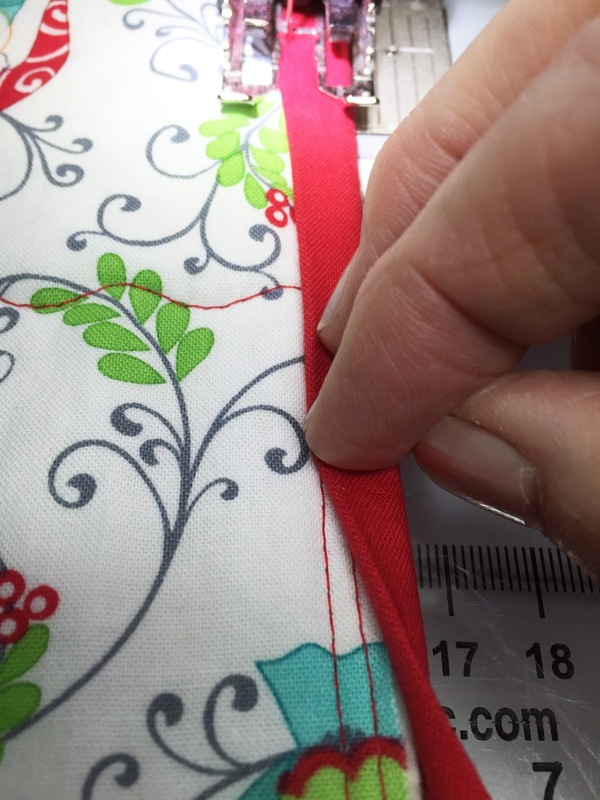 People who do machine applique often use a fine invisible thread. My current favorite is Superior Threads Mono Poly reduced sheen. 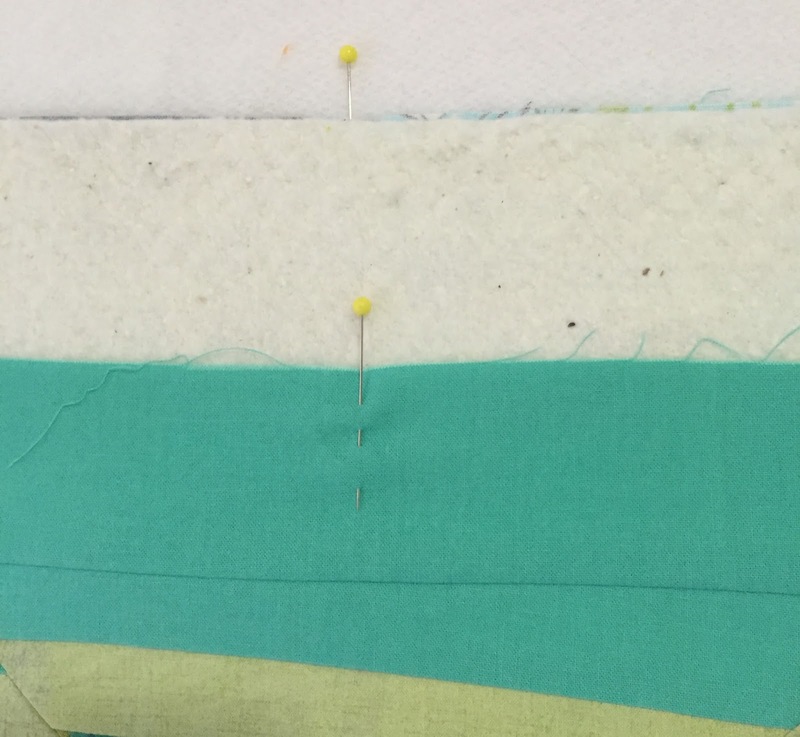 All of these threads tend to sink into the fabric, making the applique look fabulous. HEAVY THREADS. 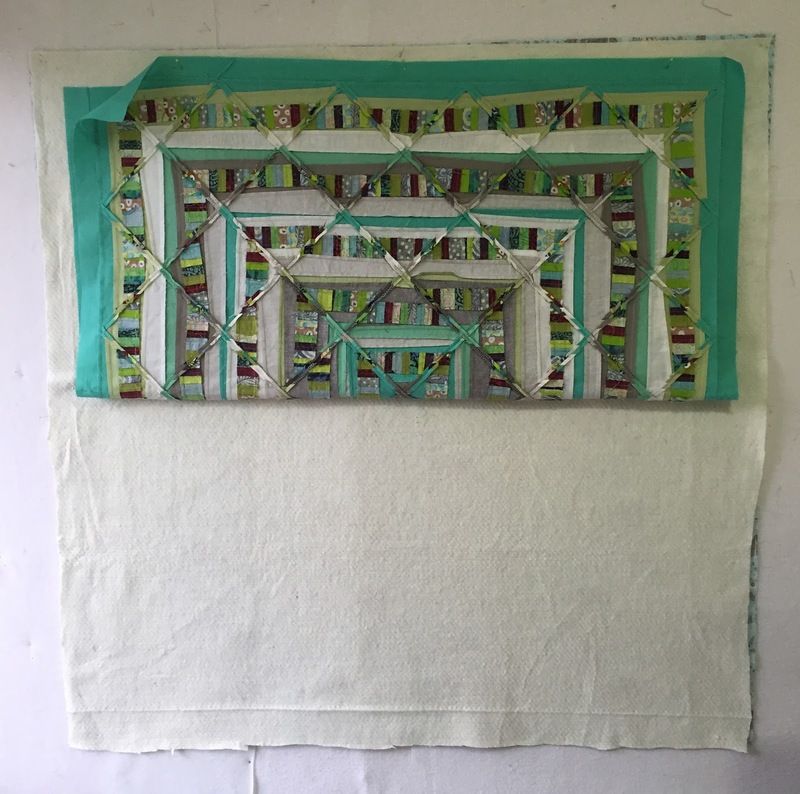 Threads that are heavier weight, such as 30# to 8# or even thicker, are fun to use to embellish quilts, or add an element on an art quilt. I use them to machine quilt as well. Some of the brands that I have are made by YLI, Sulky, and Madeira. 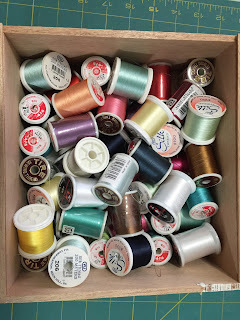 You may have a ton of 40# thread in your collection if you have been sewing clothing. 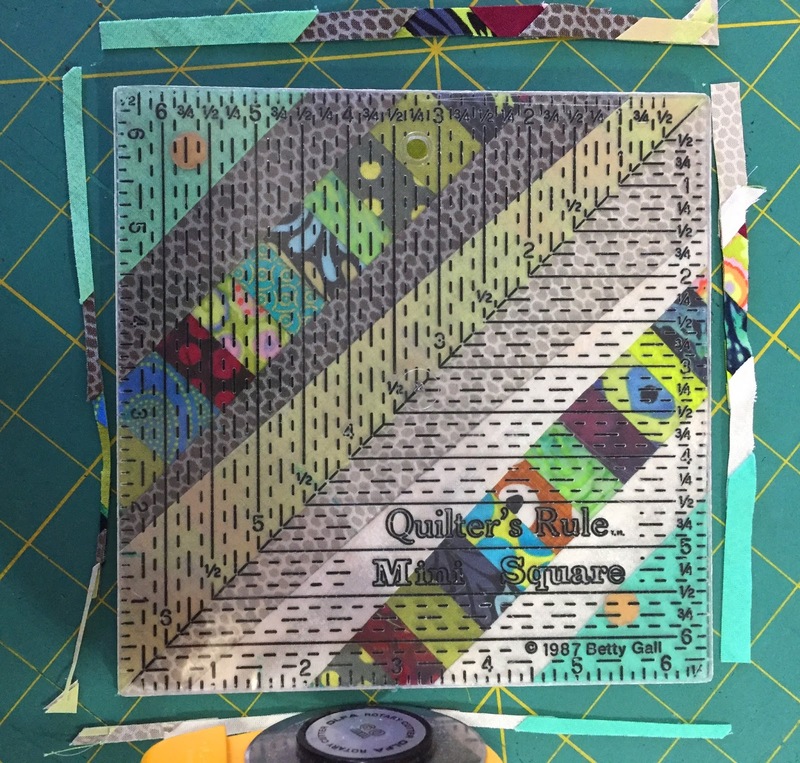 It's OK to use this in your quilts too, but it is heavier than the 50# thread, and can distort your blocks by making your seams a scant larger than 1/4". OLD THREAD. Well, what can I say about old thread. We all love the old wooden spools and the cotton threads that we inherited from our Mothers and Grandmothers. 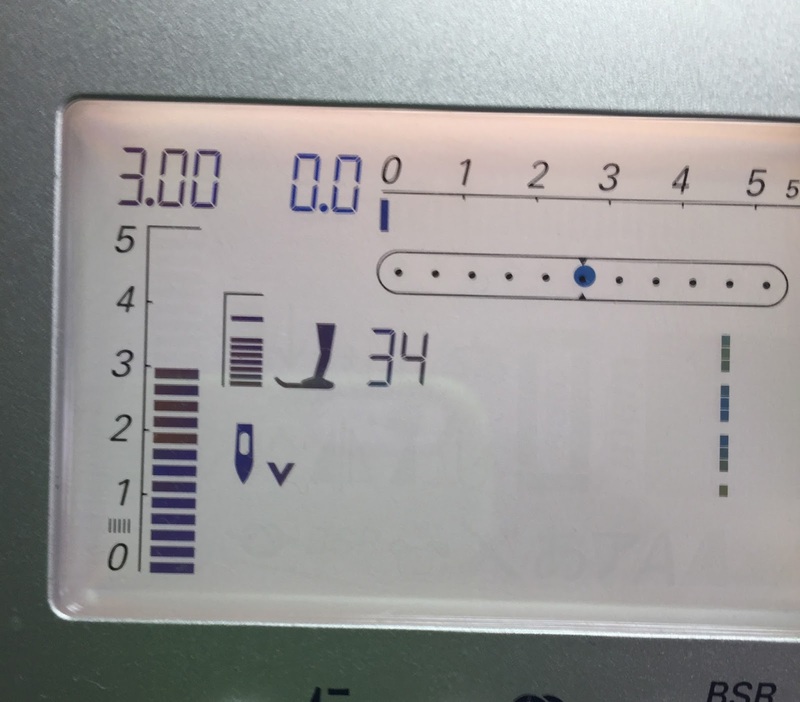 I recommend doing a quick test before using these threads in a quilt. Unwrap the first layer of threads. Has the color brightened? If it has, that means that the thread has seen too much natural light and has started to degrade. Take a length of thread and break it. Does it break easily, or is it still strong? If it breaks easily, it has become too degraded to use in a quilt. 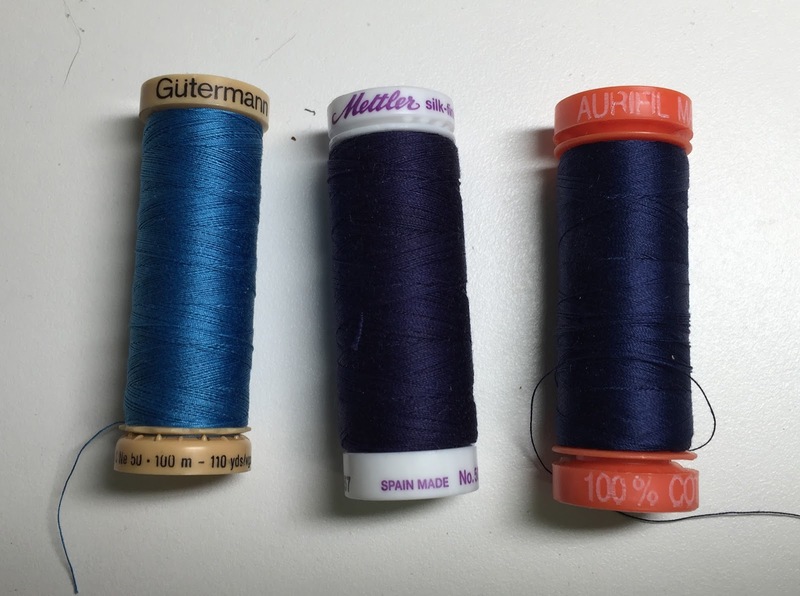 Is the old thread of low quality or polyester? Don't use it for piecing a quilt; you'll be disappointed. 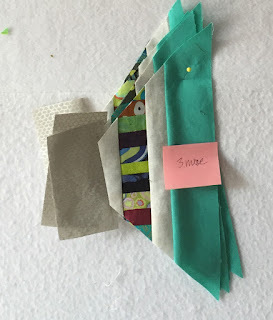 Can you use the thread for something else than piecing a quilt? The basting process uses a lot of thread and it gets thrown away after the quilting is done. Perfect. 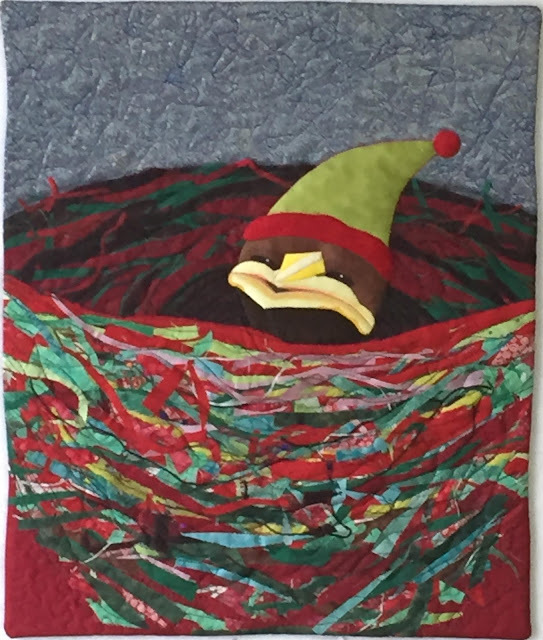 Is the quilt going be loved, used, and tossed after a short period of time? Go ahead and use the thread if it passes the color and strength test. Just remember that this old thread is usually a heavier weight than what current quilters prefer. TAKE A THREAD CLASS. 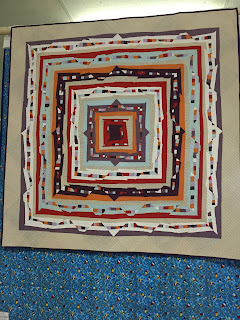 Superior Threads has a fantastic thread class that they put on at the regional quilt shows. They also have a great newsletter that you can subscribe to. 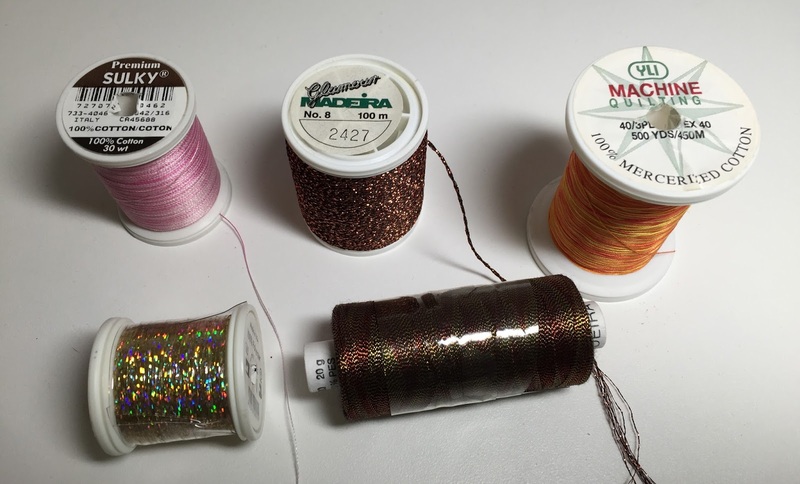 Many of the other thread manufacturers have tons of information and color charts on line or that you can purchase. National and local teachers have strong thread preferences and will often discuss threads and sell them to you in classes. Finally, remember to store your thread in dark, cool places. I have a drawer for some of my thread, and boxes that I keep in the closet with the bulk of my collection. Here is a box that I keep my silk threads in. I admit that I probably have too many threads. But I'm a quilter, and the quilter with the largest stash wins! Right? 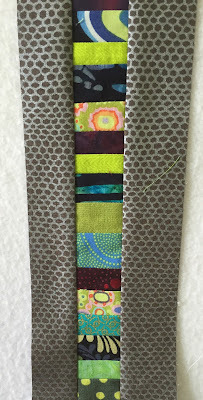 I love the free form piecing style that is so popular with the modern quilters. 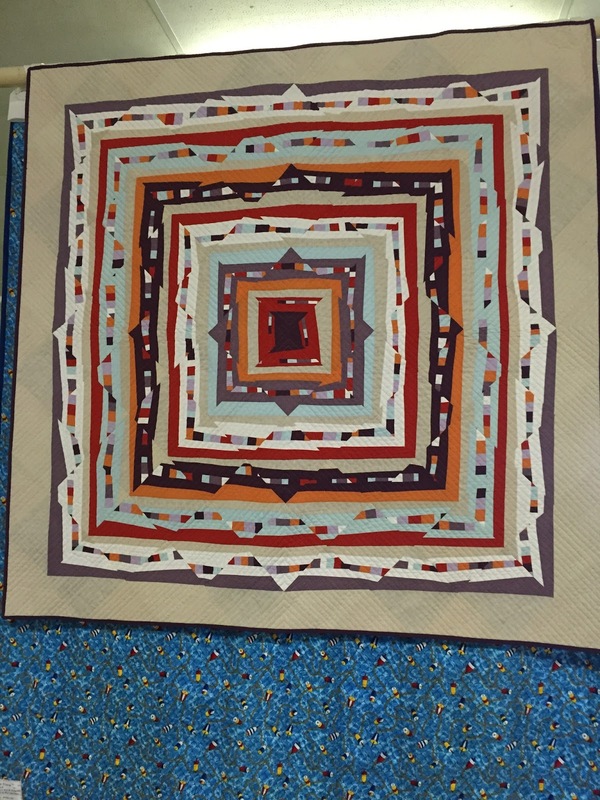 Katie Pederson was the featured quilter in Walla Walla this fall and I thought that her quilts were a perfect example of that style. She has an amazing sense of color and playfulness. My latest quilt is an incorporation of her ideas with her "On Target" quilt and my colors. 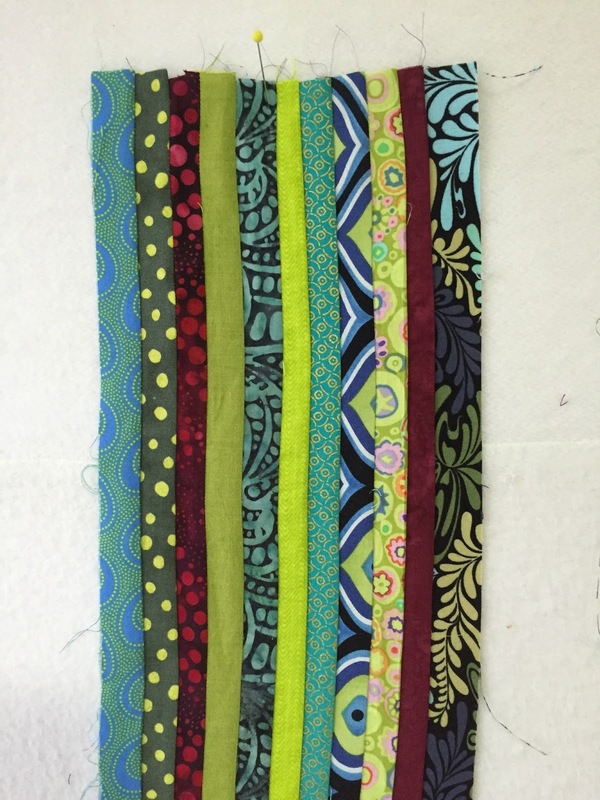 My stash of fabrics is overflowing with green so I pulled some out and added others that have wild loud colors or are complimentary to green. I started just cutting random strips about an inch wide and tossed them into a pile. Then I randomly sewed the strips together to give me a colorful strata. 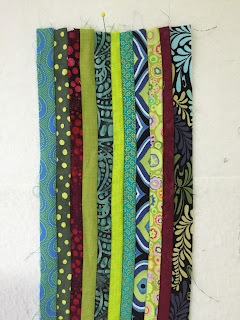 I also pulled a more sedate pile of fabrics that I thought would go great with the bold strata. 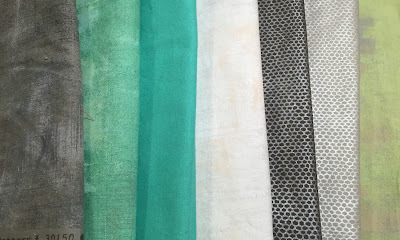 These fabrics include some of the Grunge fabric that I really like right now, as well as some shiny ones that I found in Sisters this fall. As usual when I start a new project and am trying to figure out how to cut and piece the quilt top, I have been barely able to go to sleep or stay asleep. I could see where Katie pieced this top in triangle sets, but I had to figure out how to get that wonky look. (She does teach this class, but so far not in this area!). 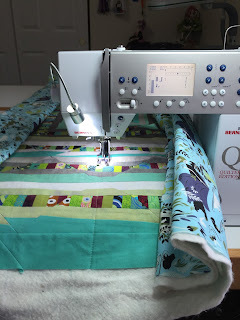 After quite a bit of ripping out and trial and error, I came up with a method that is working for me, but is probably not the most efficient way of making this quilt. After I sewed the strata, I cut them into 1-1/2" sections, pieced them together into one long strip, and attached two pieces of the first fabric. (I'm mixing up my photos a little bit, so I hope you can follow along.) 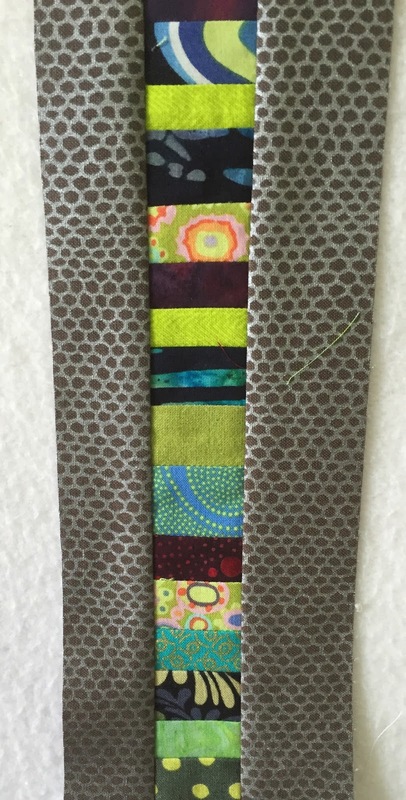 In this example, the fabric sewn to the strip set is the darker gray. The next piece to get sewn on is the color that will be the smallest triangle. In this example, I started with white for the first two pieces and then added the turquoise. 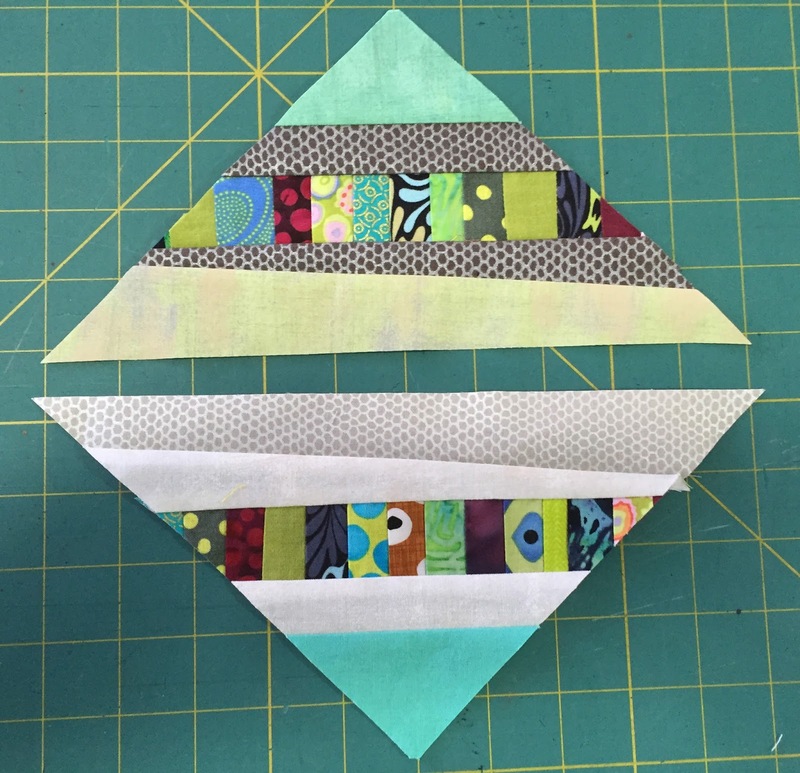 After pressing this strip set, I cut a triangle off the strip set, making sure to keep the tip of the small triangle at the top. The next step was done to get the piece to look wonky. Just trim the bottom (first) piece at an angle and sew on the color on the longest side. When I was happy with the look, I trimmed this piece a little larger and matched it up with the next triangle in the quilt. This is a real puzzle! One triangle is the top in one square, and the bottom in the next one. This definitely saves fabric, but is a little confusing. 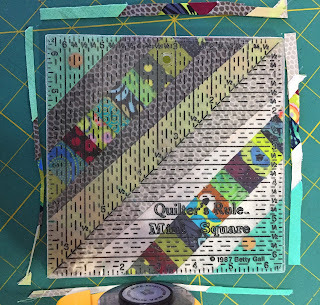 A color coded chart would probably help... as well as sewing sometime other than 3:00 A.M.
After sewing the center seam and pressing and starching the block, I aligned the center seam on the diagonal line of the 6" square ruler, and trimmed the block to size. 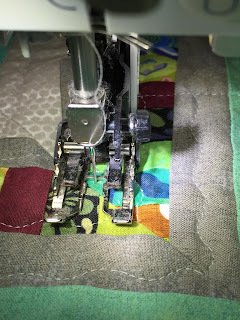 It seemed to me like this was important in Katie's quilt, so I was careful to duplicate this step. Here are the left over triangles ready for the next round. It's that time of year to make gifts! I have always liked to get handmade gifts from my relatives and friends. When I know that other people also enjoy handmade gifts, I relish the chance to make something for them. I'm passing along the torch of my grandmothers, mother and friends. This year I decided to make some holiday placements. There are so many fun and modern holiday prints and I found one with owls that I thought was just the ticket. Its got lime green, turquoise and red colors, which are all my favorites. I decided to use a red fabric for the flip side that can be used for Valentine's. So two holiday seasons worth of placements! 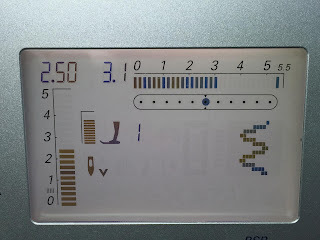 I've written this blog about the machine binding for these placements. I made 8 of them, 14" x 20", which meant that I needed 45 ft of binding. The thought of handing stitching down this much binding on the back side just wasn't appealing. So I thought about and remembered a technique that one of my fellow Clark County Quilters uses on all of her quit bindings. 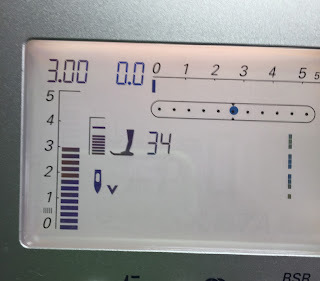 It uses two passes with the machine. One to attach the binding and the second one to finish to top. 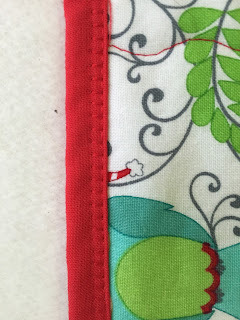 I used a french binding, which just means that you double your fabric, stitch the raw edged side, flip it over the edge, and stitch the folded edge. This gives you double binding throughout. 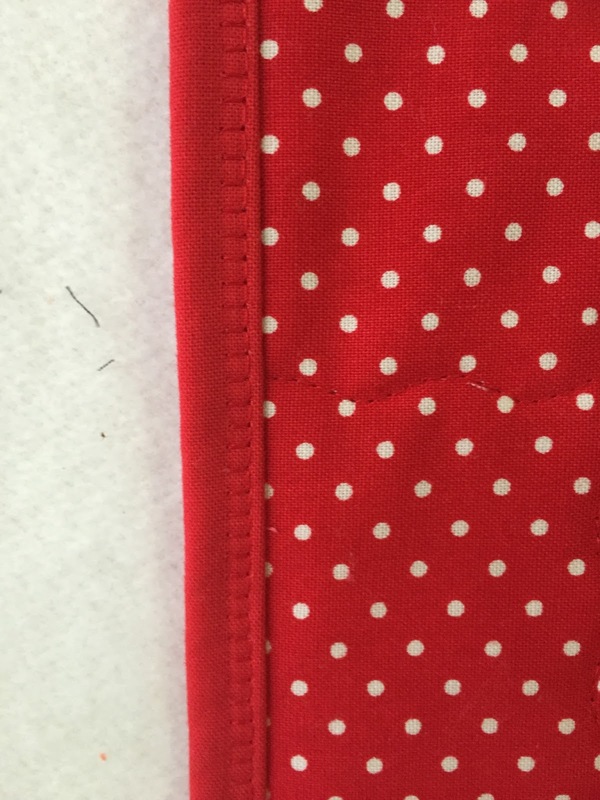 I cut the fabric strips at 2-1/4" wide and stitched all of my pieces together in a bias seam to reduce bulk. 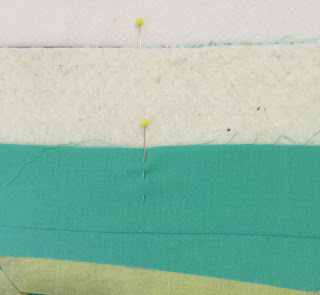 On my quilts, I stitch on the top side and then hand slip stitch the back side. But for these placements, I stitched the binding on the back side first with a 1/4" seam and the walking foot. The binding was then flipped to the front, and the corners were all pinned in place. 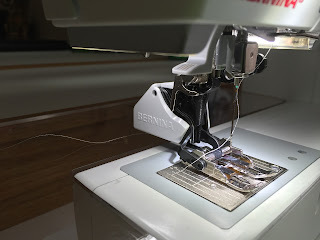 The stitch that I used was on the Bernina 440, and is #45. 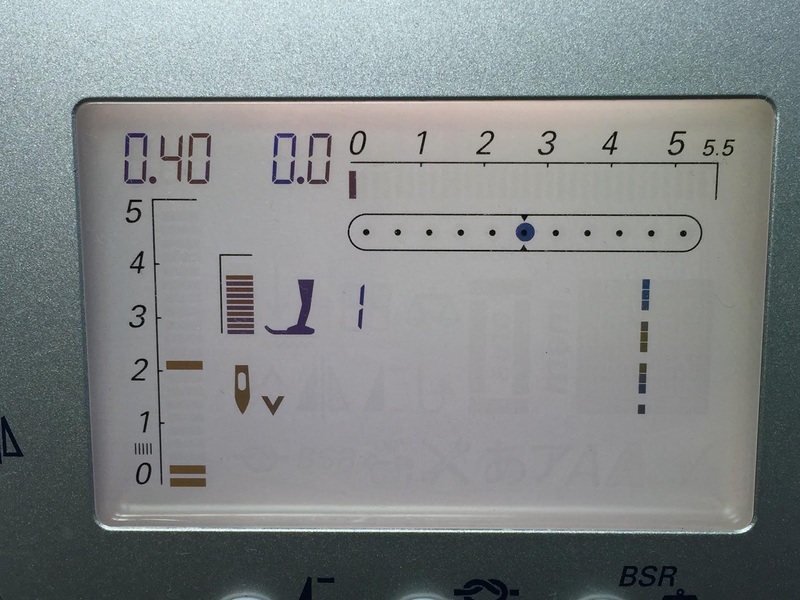 I reset the stitch to 2.9 W, 2.7 L, and hit the reverse key. Here is the screen showing the stitch. I used the walking foot due to the bulk of the seams and lined up the outer edge of the binding with the inner edge of the foot. 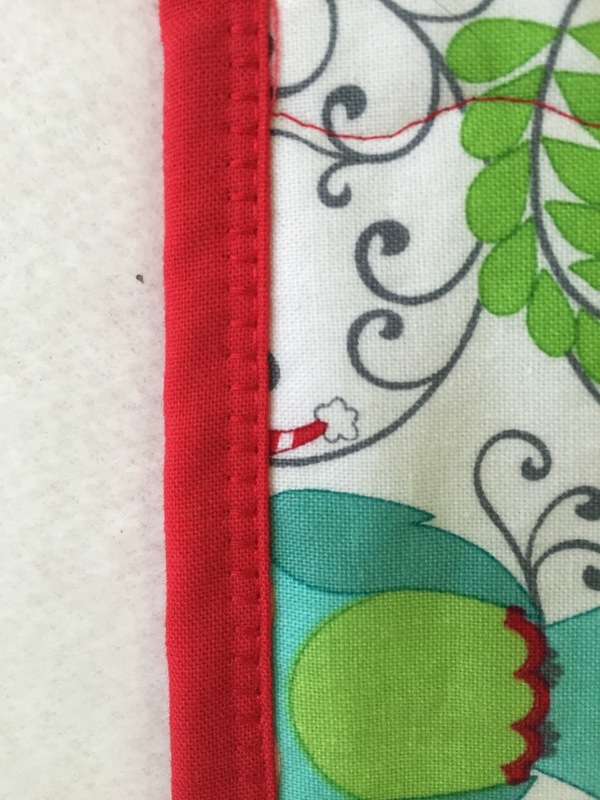 This put the seam right inside the edge of the binding and pretty close to right on top of the seam underneath. I hope you can use the machine binding technique.